Hello from Wisconsin! Yep, we are still living in my parent's basement because of the roof drama with our new home in Minnesota. The plus side is Ashford likes playing with all my old toys from the 80s. 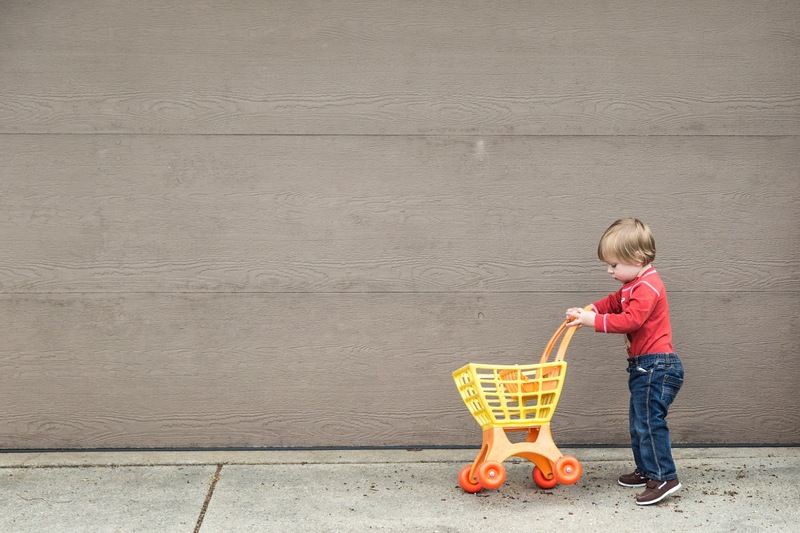 He loves this little shopping cart and pushes it everywhere! The bad news is that they cannot start the roof until Tuesday because they had to order the shingles. The other bad news is that we had to push our closing date to Friday May 30th since the roof has to be done 48 hours prior to closing for the HUD to be completed. We've been camping out here for a month, and are so ready to have our lives back! Here is a shot of the Driftwood shingles with an ivory vinyl sample to match the trim on the existing windows and garage door on far left. The second and third from the bottom of the paint strip are contenders for the siding, and the orange and two green colors are possible door colors. I love how this roofing has little flecks of gold in it to complement the ivory trim and orange door, if that is what we decide to go with. Guys, it is killing me to be 375 miles from my house and not be able to choose important things like the roof color in person! But who knows, they might just put on 'Chateau Green' shingles, anyway. We will find out when we get there. To take my mind off of not having any control, or any of my things, I've been acquiring other things. Mostly, furniture that we now aren't sure how we will move to Minnesota. I found these classic Lane 'Acclaim' side and coffee tables at a rummage sale and thrift shop, respectively. I was so excited to get them, I've always loved these tables and couldn't wait to refinish them. The side table in particular was in BAD shape with horribly streaky legs and these two burn marks. I knew I couldn't do anything about the black spots, but I wanted to redo all the flaking finish and get the bad swirly stain off the legs. There was also gross tape goo on the bottom shelf. People, you're killing me! Good thing I only paid $25. I just adore the dovetail construction of the walnut veneer and oak trim. The legs are a horrible hack job. I went on Amazon and bought my preferred supplies.....Formby's refinisher, Tung Oil finish, gloves, and 0000 steel wool. My advice when using any sort of stripper, is buy about 3 more containers than you think you need. Trust me! I blew through this 32 ounce container on one table. I bought the Formbys because it is supposed to remove the finish without removing the stain. Unfortunately, with these particular pieces, a lot of the color is in the finish itself...you'll see what I mean shortly. First things first, getting the damn container open! I had rubberized gloves on, and still couldn't 'push down and turn' so I had to resort to using a wrench to turn it while pushing the top down. Then, there was this dumb thing in there that I also couldn't get out. Seriously, what the heck?! I had to pry that off with a scraper before I could finally get down to business. I had messed around with getting this container open for about 20 minutes by this point. Dumb. To use, I just saturated my steel wool with refinisher and scrubbed in circles until the finish was gone. Then I wiped the mess off with paper towel. I would also use the big plastic scraper to help it along. I would not use a metal scraper, the walnut veneer is just too thin to risk it! You might not feel like it's working, but when you step back you can definitely tell. But in the end, the top was free from finish and I was working on the bottom shelf and legs. I got the tape off with Goof Off. Love that stuff! This entire end table has been refinished in the past, because the finish is clearly not original. Here is a comparison between the legs of the end table and the original finish of the coffee table legs....yikes! They did a very bad job. My goal is to get the color of the end table's oak to match up with the legs of the coffee table, which I am hoping to not mess with. Not sure if I can do it! You can also see how different the table looks with the amber color of the original finish removed. This is as far as I've gotten. I haven't even touched the coffee table yet, the finish on it is very bad. I got it for $55, which I think is fair. I bought a bunch of little samples of stain and will let you know how it goes with matching up the colors. This is a huge labor of love. To be honest, I don't think I will do it again. Maybe it will be worth it in the end! And hopefully on Friday we will be homeowners again! 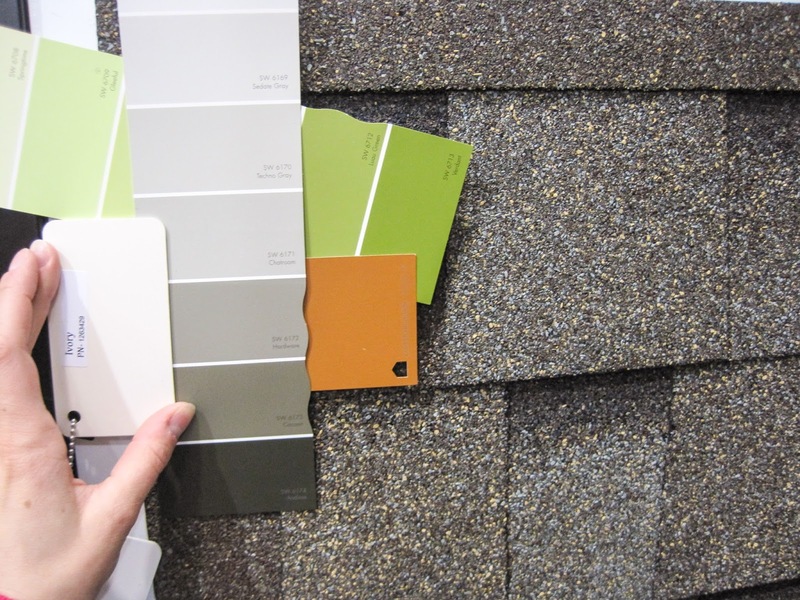 The roof color you like is going to look so good, I think its the same roof colors we used on our roof last year :) Hoping for a smooth closing! May 30 will come quickly! These are going to look freaking awesome - I am so amazed how great the one you were able to attack looks!!! 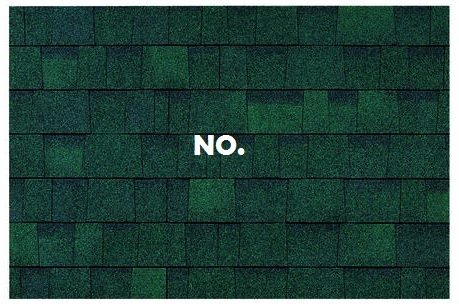 I really hope the shingles are right for you - ugh what an ordeal!!!! But a new roof, paid for, is awesome but the color BETTER be right!!! 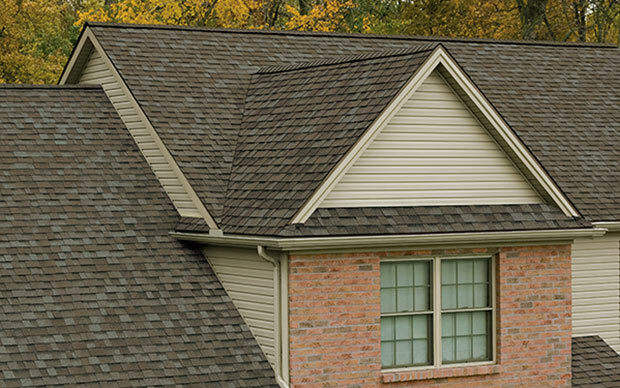 Sending good roofing vibes your way!!! My goodness, when did your baby become a boy??? Good luck Friday! I hope it all goes well and your roof is intact! Love the roof you chose. Crossing my fingers that closing goes well.